I recently had to replace my Psion Series 3a - keeping in mind the size and the price - and tried two possible solutions: The Oregon Scientific's Osaris and the Psion Revo. I hope that this article will be helpful to people in the same situation. The Osaris is almost as fat as Series 5 from which it gets almost the same functionalities for a much lower price. Not as fast as 5mx, the speed (18 MHz) was never an issue with the applications tested, even with the rare games found that could run on Osaris. My Series 3a died with most of the usual symptoms of old age (broken hinge (repaired), button bar dead, display's flat cable damaged (that's where I gave up)). I searched for a replacement but the fact is that nothing similar exists today for an affordable price. Eliminated -> PalmPilot IIIx. I could borrow it from a colleague an, despite it's nice size, and very good screen, I still prefer a keyboard (even small) to the graffitis. 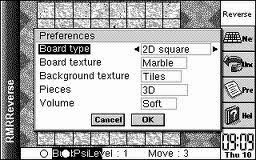 In addition, the software features are not as advanced as what I'm used to find on Psion machines. I was however almost tempted by the Handspring Visor, but it was not available in Europe at this time. If you don't need a keyboard, you should take a look at it. I noticed the Osaris in the Argos catalog and purchased one (in January 2000). The specs of the Osaris were meeting or exceeding most of my needs. The first thing is the tiny screen, which you can workaround by adapting the display (check here for some basic tips). First thing I did was to download every Epoc software I could find and try them. Most of them will execute BUT won't fit in the screen, a few other will display a font missing error and this is very frustrating to realize that the limit is not your CPU or your memory, but just this screen! I also had the feeling that the screen was less readable than my Series 3a. This feeling confirmed after a few hours. This screen will even need the backlighting in normal conditions! The 53 keys keyboard has a good response, as good as Series 3x and better than Psion Revo to my humble opinion. Some review highlighted that it was ugly and flexible. It's ugly, true, but you should see the one that comes with the Revo! Flexible? 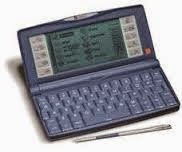 Yes, a little, it could be an issue on a Palm Pilot, but you don't write with an Osaris, all you will do is pointing. Note: Epoc R4 seems to allow more stylus independence than R5. Example: the Extra menu can be browsed using the arrows on the keyboard, which is not possible on R5. On the Series 3a, the 512Ko were enough for storing my documents. I later added a Flash 512Ko because I was accumulating a few games. 8 Megs on the Osaris should be enough since you won't have many opportunities to fill up the memory with applications. A CF card slot is available anyway just in case. It's Epoc, so it can't be bad. All you need is already in the box, which tempers the fact that you won't access most of the Epoc softwares. You have the Sketch application present just like Series 5. I realized later that you only find it useful when you don't have it anymore (see Revo). A little serial cable comes with the Osaris. It's long enough and much more convenient than a bulky cradle (see Revo). The Epoc connect is just like PsiWin, so no surprise. I noticed some problems with the synchronization that I don't have with Revo (seems easier to sync. Contact than Data). The IrDA works at once and I almost regret to have rare opportunities to use it seriously. The cell is placed on the side of the device, which is not very convenient in practical. This is not really an issue. Just don't be surprise if you hear the default alarm when some Epoc game call for a specific sound, that the best your Osaris can do. Two AA batteries are provided with Osaris and should allow around 30 hours of normal use. After one week of intensive use with frequent need to use the backlighting, it was still indicating a battery level of at least 2,4 volts. The backup battery is a CR2032 and I noticed that it's level dropped bellow 2/3 after one day! Considering the price of such a battery (which should last for months), this could well increase the "cost of ownership" of your Osaris! The problem was reported in some reviews on the web but was supposed to be confined to the early generation of the product. The problem is that most of them are still present in the shops and getting a replacement is a real nightmare with some distributors. Just to give you an idea, the guaranty registration booklet is bigger than the "user's manual" you find in the package. You'll have to find the digital format on the CD coming with the Osaris. But who reads manuals today? First, Backup Battery Management problem and related problem as told before. In good condition, I sure the Osaris could satisfied a large public, but it really didn't need this issue to start its career. Second, the bad quality of the screen and its limitations. - For 249£ you get a complete self-sufficient palmtop solution, with all the connectivities needed... and it's an EPOC machine! - Try to see the Osaris in function before deciding, maybe you'll get use to the screen better than I did. 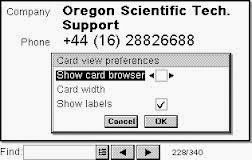 It would be great if Oregon Scientific could release a version with a bigger/better screen, I'm sure they could manage to be still cheaper than the others. Av. Price (January 2000): 443.13 Euro. The Revo has the power of Series 5mx. Same 32-bit ARM710T RISC CPU, running at 36MHz, 8 Megs of RAM, but a smaller screen (480 x 160 against 640 x 240 for the 5mx). Its size (157 x 79 x 18mm) and weight (200 gr.) 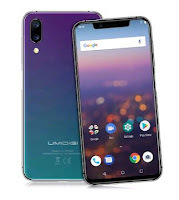 and its lower price compared to the 5mx could decide most people who don't really need all the features the big brother. If you visit the official Revo site (www.psion.com/revo), you may wonder if it's sponsored by L'Oreal or Jacques Dessange (I just returned my registration card and I'm expecting to receive a bottle of shampoo in the "welcome pack" promised). You'll have to admit that its esthetic is a premiere in the PDAs world. If you're married, this will help you to be forgiven for having purchased such an expensive toy! Believe me. To be a little more specific, it is as contrasted and readable (0.24mm pixel pitch) as a printed document! Of course coming from Osaris the shock can only be felt stronger, but even compared to Series 3a, it's much more readable even in the darkest places. Really, no regret for the Backlight. I could say that this is not the fastest keyboard I tried on a handheld, but I'm not a fast typist anyway. Ugly, thin and I'm surprised that I didn't loose it yet, but sure I will. Sure, there will be enough tempting applications to fill up the Revo's eight megs in no time. However, the only issue would be if you really need applications like MessageSuite. At this point, there won't be much room left for anything more, and there is not extension possible here. The way Psion located the applications on the main bar (contacts, agenda, time, jotter...) and placed some others in the Extra compartment (Word and Sheet) show exactly what the Revo is intended to do: It's an organizer first...but can be more. Moreover, if I look back, I mostly used Word on Series 3a as a jotter, and Sheet very occasionally. 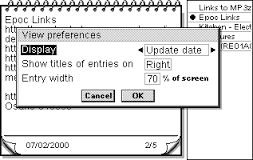 There is no Sketch application, meaning that if your Revo is unable to process any drawing in your documents. However, I don't see why this application shouldn't be available separately for Revo but so far, I didn't find it. There is no OPL editor: not an issue for me and again not part of the job Revo has been designed for. The excellent Symbian's Epoc Emulator should provide a good alternative if I have any regret. You will first be surprised by the small size of the Revo, and then you will have a different surprise discovering the bulky cradle that comes with it. Certainly, the design is intelligent and it's very easy to "dock" you Revo in it. It will provide the serial link to your computer as well as the necessary power to recharge the batteries. Unfortunately, due to the nature and location of the Revo connector, I don't think we'll ever find a smaller model in the future. You can take the power adapter separately if you travel. The IrDA port is located at the back of the Revo, which allows a convenient use. Revo comes with a collection of alarms sounds (real sounds here) and is capable to produce the samplings present in most EPOC applications. You can import any sound from your PC but there is no recorder in Revo. From my personal experience, the use of this feature in years can be counted on the fingers of one hand. This is my only blame to Psion. With its size, you may think that the Revo is the most convenient PDA available for people who travel often. If you ever traveled with a PDA, you know how convenient it is to change two AA batteries if needed. They are cheap and virtually available everywhere in the world. This is not true anymore with Revo: you get a proprietary rechargeable battery, with an announced longevity of 12 hours, and with the use, you realise that this is in fact a maximum. This is just not enough, you'll barely make one week of occasional use of it. For comparison, a Series 3x could last up to 32 hours on two AA batteries. So, forget about leaving on holidays for even one week with Revo in your pocket without managing a place for the power adapter in another one. Note that Psion propose a Universal Power Adapter. As usual, Psion still produce clear and pleasant manuals. It contains basically all you need to know and is presented in a convenient format. More detailed documents are provided on the accompanying PsiWin2 CD. - If you can appreciate the freedom of a real operating system but don't need your PDA to replace completely your desktop computer on travel. It was really heavy duty. The size was just ok. The screen, I realized later with the recent experiences, was exceptional in quality. I could re-use the accessories acquired with my first Series 3. It felt several times on the floor and survived... I just hope it won't happen only once to my new Psion! 1. Remove the toolbar whenever possible. 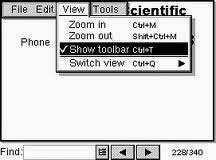 You'll get noticeable gain of space by removing the toolbar in most applications. 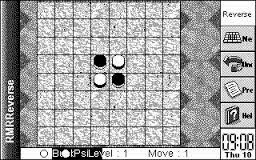 By adapting the Preferences, you can play this game comfortably with the 2D square board type. Avoid the Animated effect for the Pieces if you want a smooth gameplay. Atomic (tetris game) will run fine. Just turn the sound off if you don't want the Osaris to sound it's favorite alarm beep all the time. Simcity is said to run fine also on Osaris.